Back home in New Zealand, our family was quite heavily involved in an outreach endeavour called ‘Naenae For Christ’. The idea being to hold weekly outreaches within the local community of Naenae with the intention of proclaiming the gospel of Jesus Christ. We have had to part with that group for the time being because of our move to California. Happily, the dedicated Naenae for Christ team is continuing to work diligently with some encouraging signs beginning to bear fruit. Whilst we cannot help them physically, we continue to pray for them and the work that the Lord is doing there. Today, we headed down the Number Five freeway to Buena Park, which is approximately one hour drive south of our house. One of my Seminary Professors was holding an annual outreach event at the church where he is the Senior Pastor, Bible Church of Buena Park. 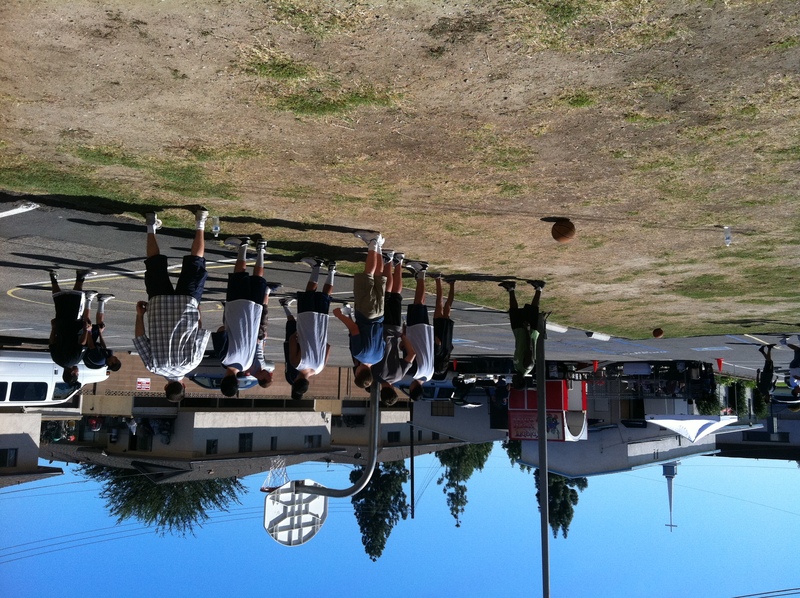 I was very interested in this event not only to serve in some way, but to also glean ideas from the outreach. One thing is almost certain, when you organise an outreach event in Southern California, the weather is going to be beautiful and today was no exception. to sign-in regardless whether you were a player, a helper or a spectator (like us). Once signed in, we received a paper wrist-band which was essentially our meal-ticket. I thought the sign-in was a wonderful idea. It gave the church a true indication of the number of people who turned up and it would also enable the church to follow-up on those who attended. 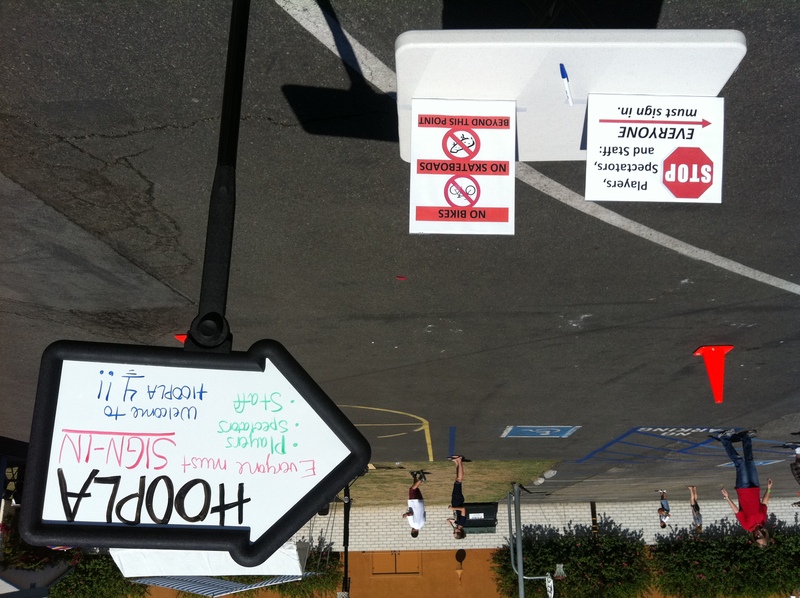 The Hoopla event is a half-court basketball tournament where teams once entered would then compete furiously through a round-robin of 7-minute games and then through the play-offs. The round-robin meant that you played each other several times. Around noon, we broke for lunch and what a great lunch it was. Approximately thirty faithful servants served throughout the day and helped provide the meal: Cheeseburger and/or hotdog, a bean dish (not sure what was in it but it was marvelous) followed by a apple or peach crumble. I’m not sure how the players managed to resume playing basketball after that feast! During the lunch break, we all listened to a very passionate and moving gospel message from one of my fellow Seminary brothers, Matthew Watson. It’s been some time since I have heard that much passion in a message. It was very refreshing and pleasing to hear. There were approximately sixty people there to hear that message, many of whom were kids from the local Juvenile Hall (an institution that houses boys and girls between 12-18 years who have been detained pending juvenile court hearings). I can only hope that the Lord had softened some of these kids hearts during Matt’s moving testimony. We left before the day was done but not before Professor Bashoor took time out to give us a guided tour of the chapel and his study. I have captured some thoughts and ideas that we can take back to New Zealand to implement back home. Thank you Professor Bashoor, your wife Heidi and all your team for your warm hospitality. We had a wonderful family day out. We hope and pray you are all in good health and Mark is coping with his studies OK, and that the home schooling will go well.